Hi my names Derek and i'm a 20 year old male. I hurt my back weight training 2 years ago and it hasn't got better. I've had pain in my lower back and left knee pain/hamstring tendintis for 2 years now undiagnosed until recently when i went to a chiropractor who noticed that my facet joints were stiff he also said my left si joint isn't moving that well so he has given me this exercise for it. The problem is this exercise his given me is starting to cause pain in my left si joint when recently the pain has always been in the facets and the left knee. he also gave me the same exercises for the si joint this site recommends with no problems only the exercise i've sent you causes pain. I asked the chiro and he said i should just continue doing them. There's no perfect set of exercises, one size fits all. If it seems to be aggravating your problem, then I'd quit it. It's a muscle strengthening exercise actually, but the problem is that it puts your back into extension, locking that facet joint. Or, try initiating the contraction, but not actually raising your leg. Your knee pain could be a local problem but interestingly the Femoral nerve supplies the knee. 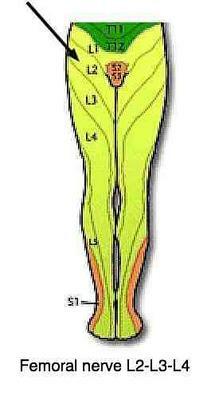 And the L3 knee root supplies the skin on top of the knee, and inner lower leg. It's diagnosed using the Femoral nerve stretch. Ask your chiropractor to test the nerve. Obviously I haven't examined you and it's clear your chiro is helping you. I think it would be wise to print this out and discuss it with him. Lot of quacks on the net! I hope this has contributed. Like to read? If so, this is my latest book of chiropractic anecdotes, available on Amazon for $2.99! Shameless self promotion! Bats in my Belfry … Chiropractic anecdotes from the coalface.